From the revolutionary minds of Pixar Animation Studios and the acclaimed director of Monsters, Inc. comes a hilariously uplifting adventure where the sky is no longer the limit. 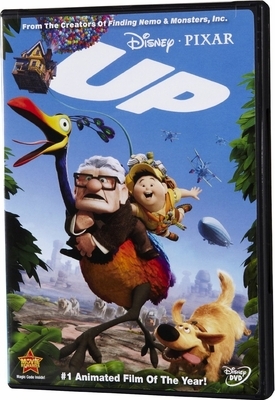 Carl Fredricksen, a retired balloon salesman, is part rascal, part dreamer who is ready for his last chance at high-flying excitement. Tying thousands of balloons to his house, Carl sets off to the lost world of his childhood dreams. Unbeknownst to Carl, Russell, an overeager 8-year-odl Wilderness Explorer who has never ventured beyond his backyard, is in the wrong place at the wrong time - Carl's front porch! The world's most unlikely duo reach new heights and meet fantastic friends like Dug, a dog with a special collar that allows him to speak, and Kevin, the rare 13-foot tall flightless bird. Stuck together in the wilds of the jungle, Carl realizes that sometimes life's biggest adventures aren't the ones you set out looking for.